Jon Danzig's World: How did we get stuck with Brexit? Labour leader, Jeremy Corbyn, has been criticised for rejecting a House of Lords amendment for Britain to remain a member of the EEA (European Economic Area) after Brexit. Instead, Mr Corbyn said Labour would push for a ‘new Single Market’ deal with the EU, giving Britain full access but without accepting all the rules, such as free movement of people. But newspapers reported that his proposal had ‘split the party’ amid accusations that he was making a ‘fudge’ of Brexit and offering ‘weak leadership’. The EU has already said the UK cannot have a bespoke arrangement that retains all the benefits of the Single Market without the obligations that membership entails. But that’s exactly what both the Tory government and the Labour opposition are proposing. They are both spending energy pretending we can keep EU benefits without being a member of the EU or its Single Market. The EU has flatly said no to such an idea. But whatever their positions were before 23 June 2016, they both now support Brexit, in one form or another. Neither are willing to give Britain another chance to consider the issue. Even though a YouGov survey published this week found that a significant majority of voters now think that the decision to leave the EU was wrong. According to the poll, Remain now commands a lead over Leave of 47% to 40%. It’s the biggest margin for Remain since the regular survey began two years ago. And a recent poll of over 200,000 local newspaper readers showed that most Britons would now vote to remain in the European Union if there was another referendum. 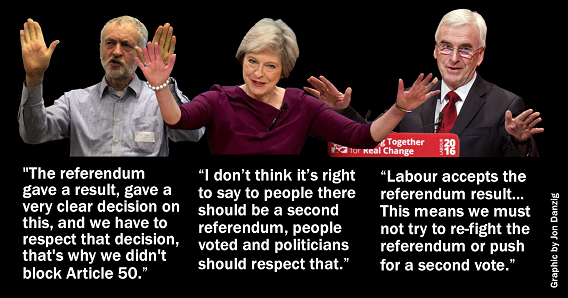 But like a broken record, both May and Corbyn are stuck in a time warp, repeating their mantra of having to ‘accept the will of the people’ as expressed two years ago. On this, both of Britain’s two main parties seem to be locked hand-in-hand with each other. Brexit has been decided, so we must stick with it, regardless, they say. It seems so odd, since before the referendum, both the Conservative government and the Labour opposition were in complete agreement with each other: Britain should remain in the EU, because Brexit would be damaging to our country’s best interests. How on earth did we get stuck with Brexit? For over 40 years Britain didn’t want to leave the EU. Britain’s membership of the EU was never previously a majority interest subject. Some on the fringes of the Conservative and Labour Parties thought Britain should leave the EU, but they were small in number. The vast majority of MPs and members of the House of Lords strongly supported Britain’s membership of the EU, and most of them voted for Britain to remain in the European Union. With the notable exception of the current Tory government, every single UK government and Prime Minister since we applied to join the European Community back in 1961 has supported our membership of the EEC/EU. And for most of our membership, the vast majority of people in Britain also didn’t want Britain to leave the EU. We’d been members for around 40 years and it was not a big deal. There was not a groundswell of opinion for Britain to leave. Even one year before the EU referendum, polling showed that support for our continued membership was running at three-to-one in favour. Nevertheless, Britain – to the shock of everyone – voted for Brexit two years ago, and we are now on the road to leaving the EU in March next year. Now Brexit is on the news every single day, most often the lead news item. Parliament, politics, the news, discussions at work, in the pub and in living rooms across the country, are often dominated with talk of Brexit. It started when politicians, who should have known better, got scared of a little Eurosceptic party called UKIP. A party so fractured, small and splintered that they have now sunk into oblivion. But senior politicians in both the Conservative and Labour Parties were fearful of UKIP. Instead of bucking the UKIP trend, they fell for it; they unwisely helped to promote and prolong it, along with the majority of British newspapers, also guilty of inciting UKIP’s message of xenophobia. It was complete nonsense of course. Most Britons didn’t have a serious problem with migration before the likes of Nigel Farage, UKIP’s on-off-on-off leader, told them they did. If you look at a map of where UKIP had the highest support, it was mostly in the areas of Britain where there was the least migration. And conversely, in the areas with lots of migrants, UKIP mostly had the least support. The foreign-born of Britain only represent about 12% of the population – that’s a normal proportion for most modern, thriving western democracies. Even among those 12% of foreign-born are many considered to be British, such as Boris Johnson, born in New York, and Joanna Lumley, born in India. Tory MP, Sir Oliver Letwin, agreed. He said that British politicians “made a terrible mistake” in failing to take on the argument about immigration, the argument spread by UKIP. It’s time to stop being fearful. Brexit came about because of unfounded fear. Now our leading politicians are too fearful to challenge Brexit; scared that they would be going against the ‘will of the people’ as expressed on one summer’s day two years ago, without any interest in finding out what that will is today. We need to let the politicians know, clearly, loudly and boldly, that Brexit is not our will. Our political leaders should have the courage to state what they already know in their hearts and heads to be true: it’s in our country’s best interests to #STOPBREXIT. Especially now that polling confirms the country agrees: Brexit is a big mistake.